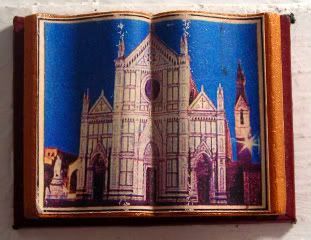 I bought a couple of Santa Croce magnets, this one I bought before ever having seen it, because it's supercute, plus I'd read about the church and it sounded amazing. The other magnet I bought, I'll use later with probably more info than you ever need to know. For now, just know that Basilica di Santa Croce (Basilica of the Holy Cross) is a medieval church down the way from the Duomo in Florence, supposedly founded by St. Francis. Seriously. Old. Like 1294 old. And that building was built to replace a structure that was there before it! The church is going through a lot of reconstruction now, so the peace inside is disturbed with the sounds of careful hammering and funny elevators. But the din doesn't stop you from reveling in the Giotto frescoes, the Donatello reliefs, and the many, many funerary monuments. It's like the Westminster of Florence - with monuments to the glories of Italian mankind, they say. Folks like Marconi, the man who invented the radio and Dante, the famous poet; and Rossini, the composer of the William Tell overture, and Niccolò di Bernardo dei Machiavelli, one of the founders of modern political science. But most people go to see the graves of the most recognizable names ever, Galileo and Michelangelo. Folks. Galileo! Michelangelo! Buried! There! It's crazy. Glories of mankind, indeed. Standing in the presence of greatness, is what that is. And, speaking of standing in the presence of greatness, the other reason I'm using this magnet for today, is because we found out some sad news three times over, of family friends who had passed away while we were in Italy. One was the mother of my friend's friend. The other two were close family friends of ours. Indeed, this morning, I got confirmation that it was actually my godmother who passed away last week. Very sad, especially since I just wrote of her husband (my godfather) passing away a few months ago. My godparents were one of the few couples who prove the existence of happily ever after for me. Nanay Marian was truly a grand lady, with a deep faith in God, a deep love for her husband and everyone around her, and, it has to be said, the best donut recipe known to man. But, Tatay Toting was her lobster, and so, I know with utmost conviction that wherever Nanay Marian is, she's very happy to be back with him.